What do you do when tragedy strikes? The world of Public Relations goes in to what they call “crisis management” mode. As a business, this is something you want to have ready and available in your back pocket when you face potential threats that may impact your brand, reputation and value. When organizations position themselves to act swiftly and promptly, it doesn’t necessarily mean they’re at fault. Instead, it gives them the power to control the message and respond as immediate as they see fit. This is not at all uncommon in sports and the Texas Rangers are no different. In fact, they received what may have been perceived as unfair scrutiny following the death of a fan who died after falling from the outfield stands while reaching for a ball thrown by (at the time) Texas Rangers All-Star outfield Josh Hamilton. Unfortunately for the Rangers, this wasn’t the first time they had experienced a fan falling over the railing, except this time a fatality was involved. I had the opportunity to speak with Rangers’ Manager of Security & Parking, Dana Jons. When asked about these incidents and others around baseball, Ms. Jons explained that “They are tragic events that could unfortunately happen anywhere. Security is absolutely a priority for us and we want to make the whole fan experience enjoyable and safe when fans come to Rangers Ballpark. One thing you have to consider when you’re creating this environment is that accidents can occur, but it is us to be proactive and minimize the chances of them happening. What happened to the gentleman (Shannon Stone) that fell from the stands in 2011 was tragic, but could have happened at just about any other stadium in baseball.” Ms. Jons mentioned that stadiums are designed for fans to enjoy their experience at games and unfortunately fans sometimes get carried away; which is when accidents can occur. In response to the first incident of an individual falling over a wall in April of 1994, Club officials raised the railings from 30.5 inches to 46 inches in the upper and lower areas of the park. Taking these measures to make the stadium safer is inadmissible evidence in court in order to prove the Texas Ranger’s facilities were inadequate to protect spectators, but it could be shown the 14 foot left field wall with railing was not high enough to protect the fan from falling. While the Rangers technically would’ve breached the Limited Duty of Care, our legal system does protect American teams with an Assumption of Risk Doctrine. Therefore, it is up to the spectators to pay attention and look out for their own safety, which is an inherent risk taken when attending a ballgame. It is up to fans to be aware of fly balls, broken bats and common for players to interact with fans by signing autographs and tossing balls to them. This player interaction is an area that the Ranger’s organization really takes pride in. Major League Baseball Rules dictate player activity once they’re within the 45 minute window of the game beginning. Prior to that, the guys are out there shaking hands and kissing babies during their homestands. The interaction fans have with players is only part of the fan experience though. Rangers’ Community Relations is very active in the community and assists with many player appearances throughout the year. The Rangers also hold a Fan Fest at the Arlington Convention Center in February prior to the start of Spring Training. 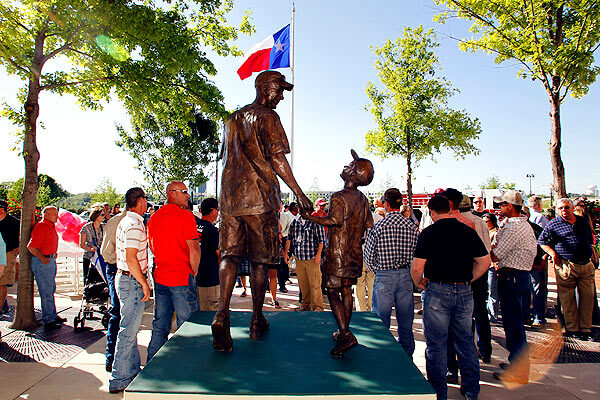 Ms. Jons mentioned a neat event this weekend that that will involve a movie night at the ballpark where fans will be able to watch their Rangers play on the road in Houston on the Jumbotron, followed by The Sandlot, and capping the night off with a sleepover on the field. It’s fair to say that in addition to their performance on the field, the Rangers organization has been doing quite a bit for their fans off the field as well. Professional franchises would not be who and where they are without the support of their fans and it’s good to see the Texas Rangers are second to none when it comes to fan appreciation.